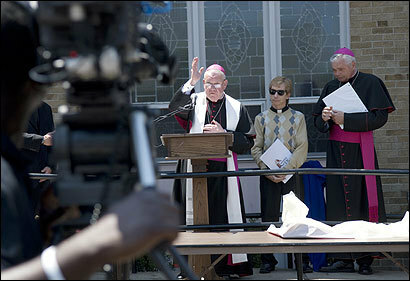 WATERTOWN -- Bishop John Dooher's father lived with stroke complications for 17 years. Then, his mother developed Alzheimer's disease. But they still shared their faith, even if they couldn't make it to a church. "The one thing they would never miss was the daily Mass on television," said Dooher, 64, who is auxiliary bishop for the south region of the Roman Catholic Archdiocese of Boston. Boston Catholic Television has broadcast Mass for about 56 years. It has aired the flagship program, which has been broadcast daily since 1973, from a television studio set, first in downtown Boston and then in Newton, where it rented a building for more than 35 years. Next month, the station is to move about 1 mile to a $5 million facility in Watertown, said general manager Jay Fadden. With money from an endowment and donations, a dilapidated, 50-year-old convent on the property of St. Patrick's Parish was transformed into a television center that features two new studios and an authentic chapel with stained glass windows and pews for 50 worshipers. Station employees hope that updating their technology, including digital and high-definition broadcasts, will let them produce better programs, increase the shows targeted at young Catholics, and attract more viewers, especially in the suburbs. "If you don't have the right technology, you can't communicate," Fadden said. "The more you know about your faith, the more you understand it." More than 175 Massachusetts communities receive the cable channel, but it only operates 24 hours a day in Boston and Brookline. The daily Mass and recitation of the rosary are the station's most popular programs, especially among those who are unable to make it to church. The station estimates that about 250,000 people a day watch Mass either on television or the channel's website. But the station is competing with larger national religious networks such as Trinity Broadcasting Network and Eternal Word Television Network. The latter says it reaches roughly 144 million homes. Lesley Northup, associate professor of religious studies at Florida International University, said religious programming peaked in the late 1980s and early 1990s. To draw more viewers, the Boston station will have to offer an alternative to the programming provided on larger networks, she said. "It's amazing to me that people will, for example, listen to the television for an hour just reciting the rosary," she said. "A lot of Catholic programming has got this one-on-one thing where you're . . . praying along with some voice, and I think that helps people feel connected." The Rev. Robert Reed, Boston Catholic Television's director, said he does not fear that technology will replace personal interaction. When he looks into the camera, he said, he sees the people who need his help, especially those who have strayed from the church. "Ultimately, when I help out at a parish on weekends, I realize that's what it's all about," Reed said. "It's not about television and the Internet in and of themselves, but using it for the sake of building up the church."